A 65,000ft2 leisure centre comprising two swimming pools, a gym, multi-purpose sports hall and cafe across three storeys and basement level. The facility replaces the original Olympia Leisure Centre built 1983 and is part of Belfast City Council’s Leisure Transformation Programme. 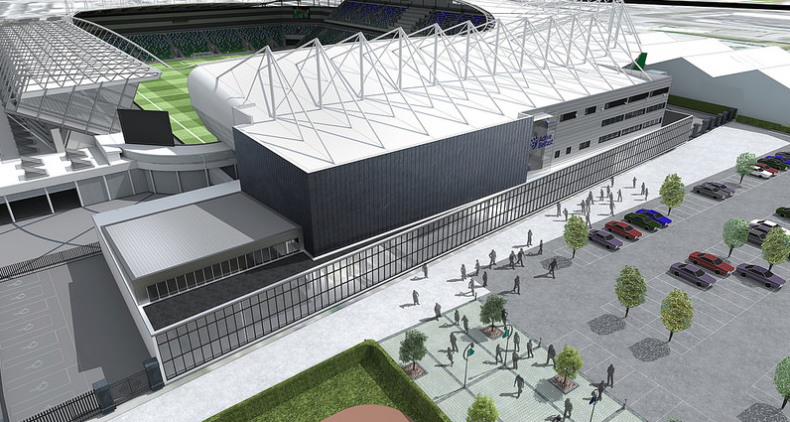 Belfast City Council submitted a planning application (Z/2013/1437/F) in December 2013 proposing an extension to Windsor Park football stadium’s West Stand to facilitate a new leisure facility to replace the 1983 Olympia Leisure Centre. The application was approved in April 2014. 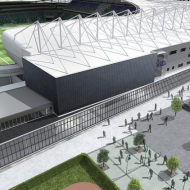 Belfast City Council submitted a further planning application (Z/2014/0594/F) in May 2014 proposing further redevelopment of the overall Olympia site to provide 2no. 3G playing fields, childrens play area, relocated car-parking and associated landscaping. The application was approved in March 2015. O’Hare & McGovern commenced construction on the new leisure centre building in January 2015. The facility is due to open late 2016. Demolition of the 1983 Olympia Leisure Centre building will follow. This will enable construction of the associated outdoor facilities and landscaping of the site which will include a ‘tree lined boulevard’, 3G pitches and a childrens play area. Redevelopment of the full site is due by late 2017.